By finishing off the 2018 regular season with a 41-14 win over Florida State on Saturday afternoon, the No. 9 Florida Gators moved up two spots when the new College Football Playoff Rankings were released on Tuesday night. More important than the Gators’ exact ranking is the team they was ranked above as Florida checked in one spot ahead of No. 10 LSU. While the Gators would prefer to play in the SEC Championship Game, the benefit of sitting home next Saturday means there is basically no opportunity for it to fall among the ranked SEC teams. Why is that important? 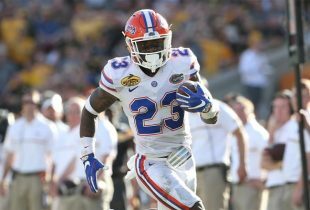 It not only all but locks up a New Year’s Six bowl, it gives Florida the best possible outcome for an at-large selection. The subset of the bowl system consists of the four playoff teams and eight additional selections. Automatically qualifying for those eight spots would be all Power Five conference champions and Notre Dame — if ranked in the top 12 and not in the playoff — along with the highest-ranked Group of Five conference champion in the CFP Rankings (right now, that is UCF). Remaining spots are chosen as at-large bids by the committee, almost assuredly from the top 12 of its rankings. Because the ranked teams ahead of the Gators picked one another off, Florida winning out has allowed it to slide into a major bowl game one season after missing out on the festivities completely. The short answer: likely the Peach Bowl on Dec. 29 or the Fiesta Bowl on Jan. 1, 2019. The long answer: Well, it’s complicated — but it has gotten easier over the last two days. Three days ago, LSU was ranked higher than Florida and looked to be on its way to the Peach Bowl. 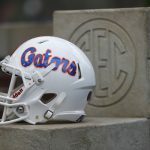 That has now changed with the Gators pegged to play in Atlanta on Dec. 29 against an at-large opponent and the Tigers likely needing to travel out to Arizona for the Fiesta Bowl against the Knights. As for who Florida would play if it makes the Peach Bowl, that is complicated as well. As it stands now with Oklahoma ahead of Ohio State, the Buckeyes will be left out of the CFP field if both teams win their respective championship games. That would put Michigan as the next at-large team and Florida’s opponent. Should the Sooners lose and OSU win, Ohio State would enter the playoff with Michigan playing in the Rose Bowl. That would likely make Texas or West Virginia the next at-large team likely headed for the Peach Bowl. There is one other scenario to consider, of course. Should Georgia beat Alabama in the SEC Championship Game, both the Bulldogs and Crimson Tide would make the playoff field. That would make Florida the next-best SEC team, which would send it to the Sugar Bowl in New Orleans on Jan. 1, 2019. UF would face Oklahoma in that scenario. So while the Gators will not know their opponent until after Saturday’s games are concluded, Florida should feel confident about its New Year’s Six bowl bid and it’s likely place in Atlanta. Or.. If Georgia wins, Alabama would move to #4.. Nobody new enters the playoff..